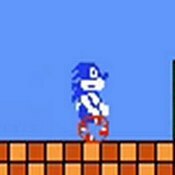 Description: When Sonic takes over the classic Super Mario game you get Sonic Bros. Featuring an 8-bit sonic as the main character and some new levels. A pretty good fan hack :D.